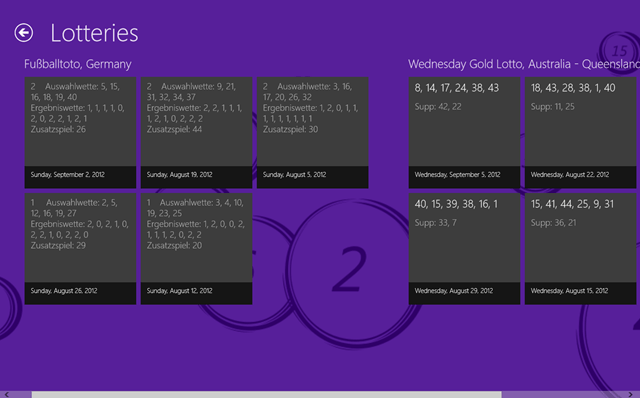 Lotteries is a free Windows 8 Lottery app with the help of which you can check your online lottery results. 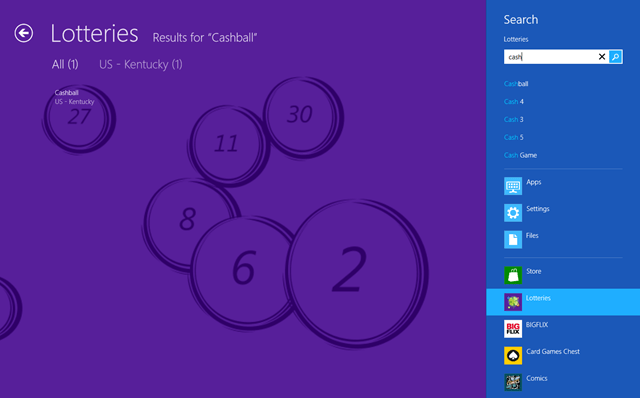 This Windows 8 app lets you find all kinds of lottery results in various countries. 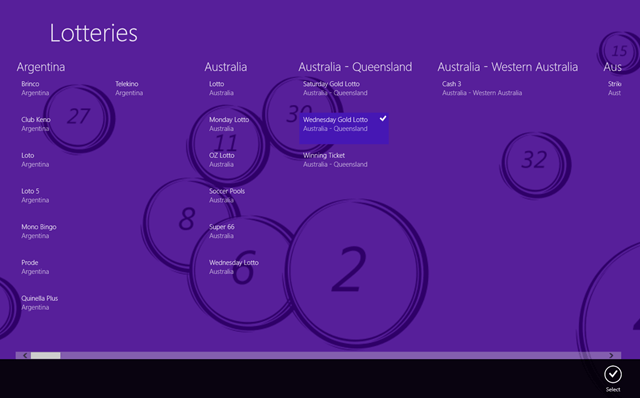 This app for Windows 8 shows you the countries it is available in or say the countries shown by it with the related lottery tickets. Lotteries support more than 80 countries with 500 hundred different lottery scratches. It will show you the countries with their lottery tickets which you can easily select and can check today’s winning lottery number. Now, there is no need to browse through the Internet or wait for the results or just have to go through the whole newspaper for finding the results. Switch to this Windows 8 lottery app and can get the lottery ticket number from the appropriate countries and can claim your prize. This is the interface or say, the start page of this app for Windows 8 where you can see all the countries with the lottery tickets you have purchased and just click on the lottery ticket which will let you check the results of the lottery. These are the lottery results for a country that you will select from the list and then, you can just check various lotteries that you own or just want to have a look on it. Or, simply you can check the results of the winning lottery. And it will be a great deal if you are the proud owner of that lottery. You can also search the lottery name with the help of the charm bar where you just have to enter the lottery name and it will find you the lottery name with the winning lottery number. So, you just have to install this Windows 8 lottery app on your Windows 8 desktop and watch your luck changing your destiny. Learn how to search an app in Windows 8 store.